Can Guinea Pigs Eat Horse Hay? If you happen to have both guinea pigs and horses then it may well be tempting to double up and feed your guinea pigs hay that your horses have been eating. This is all well and good, but there are some important variables to consider. 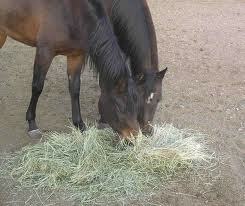 It is worth looking at the different ways that horses eat to consider which would be best Guinea pigs to eat as well. Guinea pigs should eat hay as 75% of their diet so it is definitely worth looking at especially if you can save on expense. Let’s look at some different ways that horses eat and see if guinea pigs could eat them as well. It is a great favorite of horses and has been used as such since Roman times. This hay is great for very young piggies as it is high in calcium. However, it is not so good for adult guinea pigs and they should only be given a little bit of it. It is not a hay that should be fed regularly to adult guinea pigs. Red Clover is a species of clover found in Europe, Western Asia, and north-west Asia. It is a herbaceous, short-lived perennial plant that can grow up to 80cm tall. However, the bad thing about it is that this hay is also high in calcium and should be avoided for adult guinea pigs if possible. It is fine for piggies to eat as it contains low amounts of calcium and phosphorus. Timothy Hay is a perennial hay grown in most of Europe and the Mediterranean. It always goes down well with guinea pigs. Probably your best option, but go for Timothy Hay that is green and not stalky and dusty. Bermudagrass is hay that has blades that are a grey-green color that is short and with rough edges. The great thing about Bermudagrass is that it low in calcium and phosphorus, so is fine for guinea pigs to eat. Tall Fescue is a bunchgrass from Europe and is an important forage grass used in agriculture. It is another one that guinea pigs can eat as it is low in calcium. As you can see, it does depend on what hay it is as to whether guinea pigs can eat it or not. So don’t take it for granted that they can eat it, as not all hays are equal.